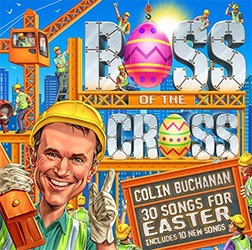 This album features brand new catchy Colin classics such as The Best Thing About Easter, Jesus Is The Hero, Peace With God At Easter Time and Jesus Christ Was Raised To Life. It’s an Easter collection that includes memory verses and songs from Colin’s nearly 20 years of recording, with a breadth spanning the joyous He Is Risen, the lively This Is The Gospel, the instructive rocker Big Words That End In Shun and a beautiful lyrical reworking of We Preach Christ. Says Colin, “I was amazed how few songs there were out there specifically intended for kids and families to learn about Easter. I’ve been busy writing and recording new tunes and hunting through my albums to create a collection that would not only cover the events of Easter but the wonder of God’s purposes – peace and life – achieved in the death and resurrection of Jesus Christ. To the world, it’s all eggs, chocolate and bunnies. I wanted an album that resounds with the wonder of the words ‘He Is Risen!”.